The alliance of the Crimean Tatars and the Ottomans was comparable to the Polish-Lithuanian Union in its importance and durability. 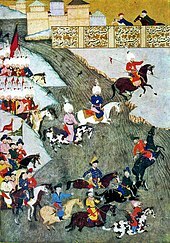 [clarification needed] The Crimean cavalry became indispensable for the Ottomans' campaigns against Poland, Hungary, and Persia. ^ To His Most Serene and August Majesty Peter Alexovitz Absolute Lord of Russia &c. This map of Moscovy, Poland, Little Tartary, and ye Black Sea &c. is most Humbly Dedicated by H. Moll Geographer (raremaps.com). The map shows Little Tartary as reaching the left bank of the Dnepr, and as including the Kalmius but not the Mius, to the north reaching as far as the Tor (Torets) basin, somewhat south of Izium. Other geographers (but not Moll) sometimes included in "Lesser Tartary"[according to whom?] the territory of the Lesser Nogai Horde in Kuban, east of the Sea of Azov (in Moll's map labelled separately as Koeban Tartary). 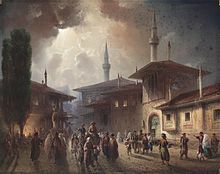 Wikimedia Commons has media related to Crimean Khanate.